My cover for Fighting Fate is ready to share with the world! I absolutely adore this cover, and I hope you do too! Fighting Fate is Book 2 in the Joining of Souls Series. It picks up right where we left Lucky and Liam at the end of Soulmated's cliffhanger. You can read the summary below the cover! Empath Liam Whelan is determined to protect Laxshmi "Lucky" Kapadia, the girl he loves, at all costs--even if it means breaking her heart to keep her alive. Stopping the joining cold means Liam's life is in danger from the Soul Seekers and the ruthless Minister Gagliardi who now has designs on Lucky. Liam has no choice but to find the strength to fight his desires, fight the joining, and fight fate. After the unthinkable happened, Lucky's "hallucinations" have been working double-time. Heartbroken and plagued by doubts, she meets a man who gives her a mind-blowing explanation for her predicament. Her apparent savior provides her with an escape from her hell: run away with him or return to her drab existence and watch Liam move on with her heart in his hands. All Lucky ever craved was to be in control of her own fate, but when her only choices fight against her heart, can she find the strength to battle for what she wants? Book 1 Soulmated has received over 150 5-star reviews between Goodreads and Amazon alone. It's safe to say by these reviews that the romantic tension between Lucky and Liam is HOT! If you haven't read Soulmated, CHECK IT OUT HERE! Here's an excerpt to whet your appetite! Enjoy! 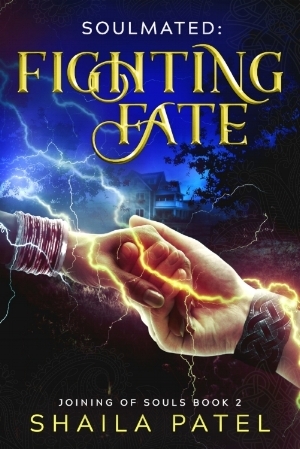 Be sure to enter the Rafflecopter below for your chance to win an early review copy of Fighting Fate! Under the cover of her porch, I returned her bag to her. We moved apart. With the connection broken, she let out a shuddering sob. The pain of separating from her hit me square in the chest. I wanted to hold and comfort her, but I was already making a dog’s dinner of this just by being here. This would set her back—set us both back. She turned away from me. Her hand shot up to her mouth, and her shoulders shook. I instinctively stepped forward, but all I could do was curl my fingers into my palms to keep from touching her. “I miss you so much, Liam,” she said, the words choked out between hoarse cries. “I’m sorry. I know I’m not supposed to be weak.” She slapped away her tears and turned to face me. A bolt of lightning cracked nearby. I couldn’t stay. The tingling was pulling us together like it was some sort of magnetic current. Her eyes grew cold in an instant. The fury of the sandstorm I sensed from her made me gasp, and I stumbled back. “Jaysus, Lucky.” We were crossing interpretations again. I was reading her emotions as air metaphors instead. She barreled toward me, her hands balled up, apparently unaware of the effect her anger had on me. “You have no right to miss me. You left me!” She beat her fists against my chest, and I had to grab her by the wrists to stop her. She wriggled free from my grip. “Whose fault is that?” she yelled above a roll of thunder. I didn’t want her to see the pain on my face, so I turned away, holding myself up on the white, wooden railing. The whirlpool of her anguish surrounded me, making my head ache. I heard her fumbling for her keys. She’d be inside soon, and I’d rather be fighting with her on the porch than be without her. I turned to face her. Her sarcasm was brutal, but I deserved all that and more. She tried to unlock her door, but the keys slipped from her grip. She stooped to pick them up, but her fingers were shaking so badly, she dropped them again. “Dammit!” She crouched a second time and sucked back another sob. I swept down and set my hands over hers to steady them. Taking the keys, I unlocked the door, followed her inside, and bundled her in a blanket from off the sofa. Lucky didn’t protest. We stood there, dripping water on her mum’s carpet, staring into each other’s eyes. Grabbing fistfuls of the covering around her neck, I gently rocked her, tugging her closer, fighting the craving to kiss her. My breaths came out fast and shallow, and only clinging to the material with both hands kept me from sneaking a touch of her soft skin. If I didn’t leave now, I’d stay because I didn’t have an ounce of the strength she had. Maybe I was the coward she’d accused me of being. Follow me on social media! See the icons at the bottom and top of this page! Ends 2/20/18 at 11:59pm EST. No purchase necessary. Void where prohibited by law. You must be at least 18 years old to enter or have your parents permission AND have an Amazon account to receive the e-giftcard. If the Amazon account is non-U.S. based, the equivalent of $25 USD in your currency will be awarded. The winner will be chosen by Rafflecopter and notified by email within 48 after the end of the giveaway. You will have 48 hours to respond, or a new winner will be chosen. No substitutions for prizes. All decisions are final. Odds of winning will vary based on the number of eligible entries received. If a mailed prize is returned for whatever reason, another winner will be chosen. Shaila Patel is not responsible for any lost, stolen, or misdirected prizes. You can use the Contact page of this website if you have any questions. This giveaway is not affiliated with any social media companies associated with Shaila Patel, Author, East Girl Publishing, or any other entity unless specified. The above prize is sponsored by Shaila Patel, Author.